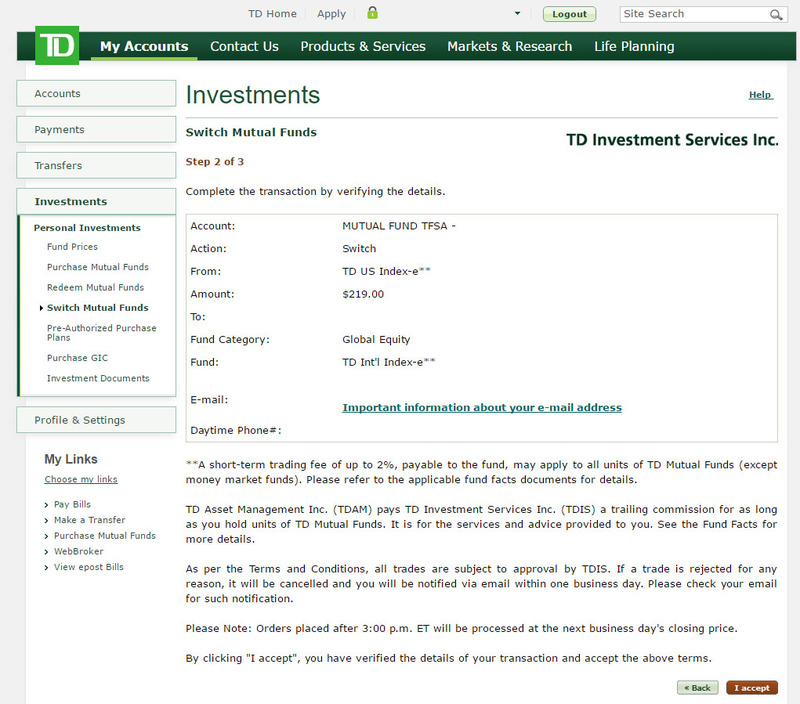 If it’s your first time re-balancing your TD e-Series index fund portfolio through the TD EasyWeb portal, it’s always a good idea to make sure you are doing it correctly. It’s not a difficult process, but the following will show you how to calculate how much to move from one fund to another, and the exact steps needed to re-balance your TD e-Series index fund portfolio. 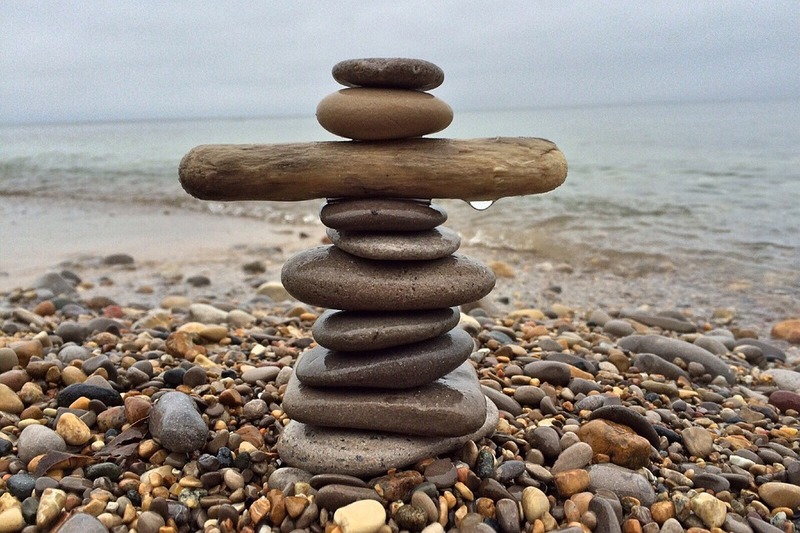 Why re-balance you index fund portfolio? A person will re-balance their portfolio based on their target percentage allocation in all of the different funds they hold to ensure they retain a diversified portfolio. For example, in my personal portfolio of TD e-Series Index Funds, my personal target is 23% in the Canadian TD stock index, 23% in the American TD stock index, 23% in the International TD stock index, and 31% in the Canadian TD bond index. Over the year, your various index funds will go up and down, and when they stray enough from your target, it’s time to re-balance – sell from the index funds that are doing well, and re-invest them into the ones that are lagging behind. You definitely don’t have to be exact with matching your fund amounts to their target percentages. There are no trade fee’s or mimimum amounts when making switches in the TD EasyWeb system, so you can make as many small switches as you need! Now that you’ve figured out how much you want to switch between your funds to balance your TD e-Series portfolio, the next step is actually making the switch. Same as when you bought your funds for the first time, this is the easy part. You can Buy, Redeem, and Switch funds through your regular TD EasyWeb banking portal, where you do all of your day-to-day online banking. This page is the same spot where you initially would have bought your funds. It lists all of your different investment accounts, and you should see your Mutual Fund TFSA and Mutual Fund RRSP. This is the main area that can cause some people confusions. When re-balancing your funds, you don’t actually want to ‘sell’, ‘redeem’ or ‘buy’ funds. The key action you want to do here is ‘Switch Mutual Funds’. This action will allow you to move funds without having funds removed from your TFSA or RRSP. If you were to sell funds from your TFSA or RRSP and then re-buy different funds, you will suffer consequences associated with account withdrawals (loss of contribution room for the year). Always make sure you in the correct account before switching! You don’t want to attempt to re-balance your portfolio in your TFSA, but accidentally make the moves in your RRSP account if you have some of the same funds. Then select the holding that you wish to move funds FROM and click ‘Switch Mutual Funds’. Now it’s time to fill in the details of the trade. Double check the Account, ensure that the action is ‘Switch’. Also and make sure the ‘From’ section indicates the holding you want to remove funds from. Fill in the dollar amount you would like to switch and select the fund you want to re-balance into. If you are having trouble finding the funds that you want to move it to, you can find the TD e-Series Category name and Fund name in this post detailing how to buy TD e-Series funds. Once all of the details look correct, click “Next”. The next page will give you a chance for one final review before the switch is actually submitted. On this confirmation page, it’s always good to check everything over once more! Be sure that your money is being moved around from and to all the right places. At this point you can click ‘I accept’ and the trade will by submitted! Your switch has been submitted! The order will be placed at the end of the business day, (the next day if after 3pm ET). You can now repeat this process for all of the the other re-balancing transactions you need to make, and you will now have a fully balanced portfolio! Did you found this article useful? Do you have any questions about the content? Do you feel like this article is missing key information? Let me know in the comments below. I love hearing from people, good or bad (but hopefully constructive). This is a fantastic post and really well written! 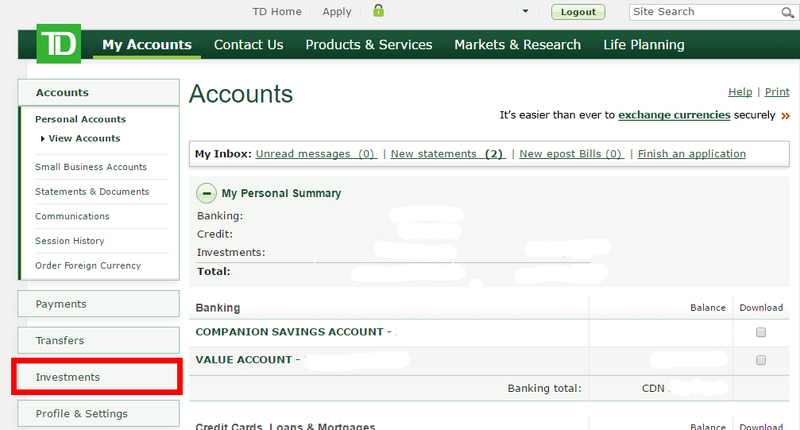 I just submitted my application to convert my existing TD mutual fund accounts to e-series. Naturally I was looking for more information on what to do next once my accounts get converted over. Since I’m new to this, I have a question for you. Once my accounts get converted over to e-series, I should just be able to use the ‘switch’ functionality in EasyWeb to update the holdings in the mutual fund account? For example in my existing TFSA mutual fund account (which is not yet e-series, I’m waiting for the conversion to occur) , the main holding is the comfort balanced portfolio. I can just use ‘switch’ functionality multiple times to restructure it using various e-series funds right? b) do a subsequent ‘switch’ from money market fund to whatever e-series fund you desire. But I think this is an unnecessary step since I already have the comfort balanced portfolio as a holding right? Thanks for the positive feedback. I’m glad to see these guides are able to help people out. For your first point, yes, you can just use the switch functionality. Within TD EasyWeb, the e-Series funds work just as all of the other mutual funds, so it’s no problem to just switch between them. I had a small amount of money within a TD Comfort Portfolio in my TFSA as well, and switched it into one of my index funds to clean everything up. For your second point, from my understanding, the main purpose of using a Money Market fund is for when people have issues transferring or depositing money into their TFSA/RRSP e-Series funds, and need to use the Money Market fund as the intermediary. Since your investments are already in the TFSA account that you want to use, switching from your TD Comfort Portfolio into the appropriate TD e-Series funds should be all you need to do. This is a great find, thank you. I too could only find posts about how to open a TD e-Series account, but nothing describing step-by-step directions on purchasing and re-balancing. Very helpful. Thanks a lot for sharing your experience, it’s really helpful for these who is new to this. I’d like to understand how can I switch my Mutual Funds from RBC to TD e-series. 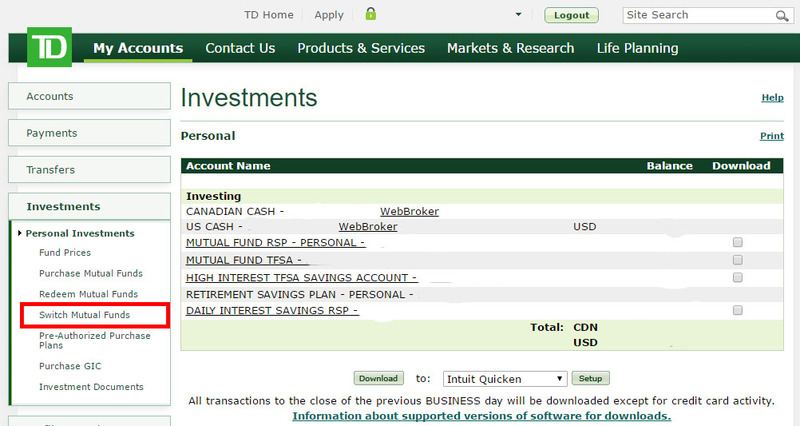 I have opened an account in TD and I’m going to open Mutual Funds e-series there. But what I should do with my RRSP that is now in RBC Mutual Funds? Should I sell all that I have there and then just move the money to TD? I know that there is an option to move the Mutual funds from RBC for 50$, but I don’t want to lose these $$. I don’t understand where to start from. Will really appreciate your help. You wouldn’t want to sell your funds from your RBC Mutual Funds account to move them to TD because that will count as a withdrawal from your RRSP, and RRSP withdrawals before you are retired take a pretty big tax hit (somewhere between 10% and 30% depending on how much you take out). Unfortunately if you want to switch, you’ll likely have to take that $50 hit to transfer directly between RRSP accounts. I have heard of the bank you are transferring into (in this case TD) being willing to cover transfer costs as it might be worth it to them to get your business, depending on how much you are transferring. Try talking to a TD rep and seeing if they will reimburse you the $50 if you transfer your RRSP savings. I was wondering if you could help me out. I’m trying to follow your steps in re-balancing my portfolio through TD. 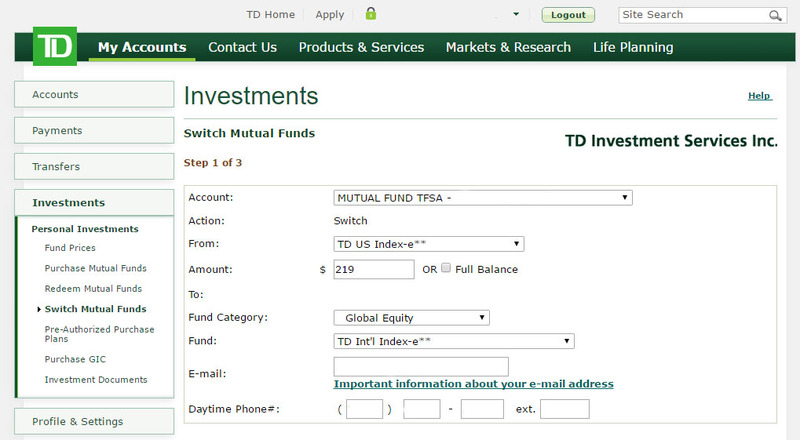 When I go to the investment tab to switch mutual funds, nothing shows up as my TFSA is not a mutual fund TFSA. I opened up a TFSA account and invested into e-series through webroker. Did I have to open up a mutual fund TFSA? And is there a way to balance my portfolio through webroker without buying and selling? You can do the switch through the TD Webbroker, it just looks a little different. When you click on your TFSA and can see the different funds that you have, you can click the ‘sell’ button. Once you do that, a new window pops up, and provides you with a ‘Action’ option which will currently be on ‘Sell’. Change that to ‘Switch’, which will then allow you to define which fund you want to switch your funds into. Hi. This is so articulate that I won’t have to go elsewhere before I actually visit a TD branch! It’s like you read so many peoples’ minds and then put up the contents on this page! My tiny question is, in the example, your column name is “Target Value of Asset”, but the Easy Web portal has two distinct columns: “Market Value” and “Book Value”. So, which of the two columns does “Target Value of Asset” corresponds to? Is it “Book Value”? Thanks for the kind words! In this situation, you want your Market value to equal your ‘target value of asset’. This would mean that after you have done your re-balancing, what your asset is currently worth (market value) should equal your target value (e.g. if my portfolio total is $10,000 and I want 23% of my portfolio in the Canadian Index fund, after I’ve re-balanced, my Canadian Index fund should have a market value of $2,300). PS I have WebBroker too. Hope that helps, and let me know if you still can’t figure it out. Hi, thanks for your post! It’s great! Quick question, will the switch cause contribution room issue? Suppose if I have $50,000 limit in total and have currently used it all on fund A. After the fund gets appreciated it will be $60,000 in value. Now I’d like to switch $10,000 of fund A into fund B. Now I have $50,000 remaining for fund A, and $10,000 worth of fund B (A+B=$60,000). However my limit is still $50,000. Will I be considered as over-contributing? That is a very good question. This is something you would maybe want to double check with a financial advisor, but I’m pretty sure that since you aren’t adding or removing any funds from your TFSA, just moving them around instead, you shouldn’t run into any issues with contribution limits. I think the CRA only recognizes when money comes in or out of your TFSA, but doesn’t care what happens within it (e.g. switching between funds). Sorry that I can’t provide a definitive answer, but hopefully that helps. So helpful-THANK YOU! Exactly what I’d been searching for. So very thorough and the Re-balancing calculator is a fantastic tool! For first timers, it’s a daunting task. After finding this article it became a snap! Thanks for comment Laura. Glad to see that the calculator is helpful to use when figuring out how to re-balance. When looking at the “fund facts” for the TD e-series funds, under “Other Fees” it says: “Switch Fee – Your representative’s firm may charge you up to 2% of the value of securities you switch to another fund”. Since I’ve never seen this mentioned anywhere (including in your article), I’m assuming they don’t charge you to make switches in the way you’ve described, correct? I wonder what that refers to. I’ve never had a 2% charge when using the switch functionality between e-Series funds. I’m not sure where this would come in, but maybe they mean if you switch from a TD e-Series fund into a non TD e-Series fund, additional fee’s may apply? That’s a good question, but shouldn’t come up if you are just re-balancing your e-Series portfolio. How to know your target percentage? There is really no ‘right’ answer to what your target percentage should be. The strategy I follow is the one from the book Millionaire Teacher, which states your target percentage of bonds should equal your age, and then you should split the rest equally among the equities. What this means, is that I’m 32 years old, which means I should have 32% of my portfolio in bonds. The reason for this is that while bonds typically make less return, they are also less volatile. As you get older, a larger percentage of your portfolio should be in less volatile assets (because you have less time to recover if your equities tank for a year or 2). If I was 45, I should then have 45% of my portfolio in bonds. This of course isn’t the answer for everyone, but it’s the strategy I’ve been following for the most part. I tend to go with a little less in my bonds, more like 30%. Hi, I currently have a small TFSA using one of Tangerines mutual fund portfolios. I found it very easy to set up recurring transfers weekly, biweekly or monthly. Is this something that can be done with the TD e-series? I’m a bit confused how that would work compared to the single Tangerine fund that I have. Thanks! You can setup automatic payments with TD e-series funds, but it will be a bit more complicated keeping your portfolio balanced since you would be buying multiple funds instead of just 1 fund. What you could do is setup multiple automatic payments to each of your funds that equals your target portfolio percentage (e.g. if you are putting in $200 a month and your target is 25% in each fund, setup an automatic payments of $50 to each fund). Then, at the end of the year, see how your funds are doing and re-balance as necessary. You should be able to setup the automatic payments through the “Pre-authorized purchase plans” menu. Hi there, I have e-series funds in non-registered accounts. When I use the “switch” function, would that trigger capital gain/loss? Please let me know. Thanks! Unfortunately I can’t provide you a definite answer to this question since I’m not an expert on tax policy. As far as my knowledge goes, investment income from non-registered accounts is taxed when the asset is sold, but I’m unsure if the switch option constitutes a sell or not. I keep all of my investment assets within registered accounts, so I’ve never had any experience claiming investment income from non-registered accounts on my taxes. Probably not the answer you were looking for, but it might be best to consult with a tax accountant or adviser. You could also try asking your question on the Personal Finance Canada subreddit. I’ve found that place to be a wealth of knowledge around investments and personal finance. I have started investing using the e-series, and it has been easy to use. I’m new to investing in general, and still had a few things I am uncertain about. How often do the funds compound interest? I’ve tried looking online for this, but haven’t had any luck. With the index funds, is it the same as with stocks with regards to how often dividends are paid out? This article has been the best yet in terms of step-by-step investing with the e-series, thank you! Thanks for the kind words Derek! How do you track the performance of your portfolio? Say, for example, I want to check the performance every time I rebalance. I’m thinking of just using an excel spreadsheet but maybe you have a better way? Google Finance used to support tracking a portfolio that consisted of e-Series funds, but unfortunately they put an end to it. Excel seems to be the way to go, especially if you want the flexibility in how you track it. I created an excel spreadsheet that tracks what I have in my portfolio based on buys, sells and dividend payments, but to get accurate information out of it, I need to manually update it with the e-Series prices. If you have any interest in me sharing my excel file, let me know! Thanks for the response! It would be great if you could share the excel sheet so I can track as well. I’ll clean it up a bit and email it your way sometime today! I’ve really set it up in a way that works for me, so it may seem a bit confusing and you may have to modify it a bit to make it work for you. I’ll try to include some instructions in it. Excellent article. Exactly what I was looking for. Could you please send me a copy of the tracking spreadsheet as well. Sure thing Susan. I’ll send it your way. If others show interest, I may clean it up a bit and post it for general use as well. I would be interested in your spreadsheet as well, if you are okay with sharing! I’ll send it your way. I’m currently working on a better spreadsheet that will be easier to use, so keep your eyes peeled. Do you have any information on how to actually check the e-series funds? Since losing Google Finance, I’ve tried to find another free option that allows 10 yr and recent weekly movement. Thanks in advance! Not dumb at all – the whole thing can definitely be very confusing, one of the reasons I started this blog. When you switch, you would put the dollar amount that you want to switch between your higher performing and lower performing funds. Mutual Funds can take a few days for the trade to go through, but the price the switch will happen at will be the price at the end of the trading day that you put the switch request in at (if you put it in after the end of trading hours for the day, the switch price will be for the price at the end of the next trading day). The prices of the funds your switching may move up or down a bit between when you make the transaction, and when the sale goes through, but that’s ok – your percentages don’t have to be exact to your targets. Your portfolio will hardly ever exactly match what your target percentages are. I was just wondering I currently have about 20k sitting in a high interest savings account. I currently have a TFSA Mutual Funds and RRSP Mutual Funds. What would be the best option for me should I open up a High Interest TFSA Account and move my 20k balance in my savings account over to that? I’m Looking for long-term savings for a house. Great question. This all kind of depends on your risk-tolerance, and what ‘long-term savings for a house’ means to you? Is that 5 years? Is it 10 years? And will you have some flexibility around when you will need it? If you haven’t yet, I would definitely recommend reading Millionaire Teacher by Andrew Hallam. He talks a lot about determining what your goals are and how to invest to match those goals. Investing in TD e-Series funds (or any other index funds) means being able to able to ride out a collapse of any given market that you are invested in. If you are planning to buy a house in 5 years, and the global financial markets tank in 4 1/2 years, would you be able to wait it out for another few years for your investments to recover (which over time, index funds do)? Check out the returns calculated by Canadian Couch Potato for TD e-Series funds. During it’s worst performing 12 months when the financial crisis of 2008/2009 hit, the TD e-Series portfolio lost anywhere from 8% – 30% (depending on how you balanced your portfolio) over that 12 month span. How would a turn in markets like that affect your financial plans? As for saving your money in a high interest savings account – that is a great option for someone wanting to grow their savings while having zero risk and full access to their money. And if you have the contribution room in your TFSA, and aren’t planning to use your TFSA room for anything else, then there is no reason not to use it. Keep in mind that there is a huge variation in what different banks will offer as a ‘high interest’ savings rate – make sure you shop around and get the best rate you can. You could also consider a GIC, if you know you won’t need access to your money for a certain amount of years. Thank you very much. Really very informative article. Much appreciate for publishing it. 1. I have comfort growth portfolio for my TFSA account. If I apply to convert my account to e-series, will the amount in TFSA will directly be moved to e-series or I’ll do it at my own? 2. As already mentioned in one of the above questions that there is 2% fee when you switch mutual funds within 30 days of purchase. I believe when I change my portfolio from comfort growth to e-series, the funds bought in last 30 days will be charged 2% fee. Do you have any information about it? 1.) 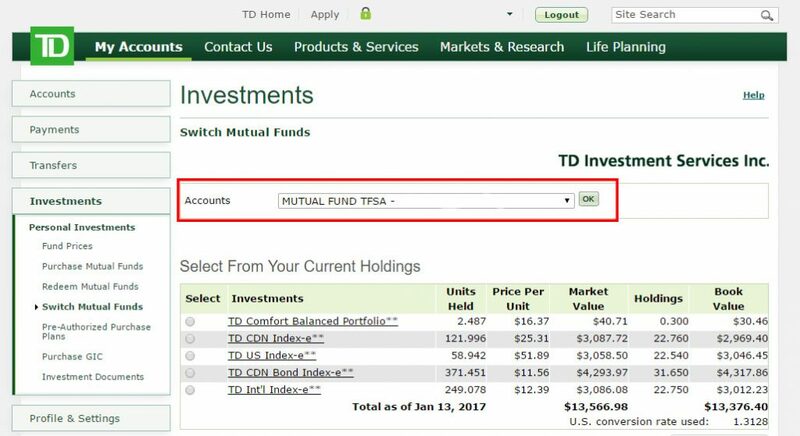 If you have a TD Mutual Fund account where you are invested in a TD Comfort Growth mutual fund, once you have converted that account to be able to buy TD e-Series funds, you will have to switch your funds yourself from your TD Comfort Growth mutual fund into the different TD e-Series funds that you would like to buy. This doesn’t happen automatically. 2.) I would suggest that you wait until the end of the 30 days before you switch funds so that you can avoid any fees. I’ve never sold any funds within 30 days of buying, so I can’t really comment myself on exactly how much those fees are and how they work. Hi! Thanks for the tutorial! I have a question about this part: “If you were to sell funds from your TFSA or RRSP and then re-buy different funds, you will suffer consequences associated with account withdrawals (loss of contribution room for the year).” but if you sell the mutual fund, technically the cash is still inside your tfsa/RRSP, so that shouldn’t count as a withdrawal, right? When holding TD e-Series through a TD EasyWeb Mutual Fund account, purchases and sold funds come from and go directly to the associated account, which is usually your chequing account. Selling the funds will move them directly to your chequing account, therefore counting as a withdrawal from your registered account. You are right when it comes to TD Direct Investing though, if you sell a fund, it stays within your registered account (TFSA or RRSP) as Cash, so you aren’t making a withdrawal from the account.